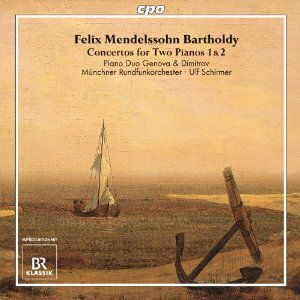 Do Mendelssohn's early Concertos for Two Pianos recive more attention than they merit these days? If so, it makes up for over a century of complete neglect; they were only first published in the early 60s. Today, however, they are doing very well in the CD catalogues, a fact at least partly explained by the relative paucity of great works in the genre. Like almost all composing prodigies, Mendelssohn initially gained fame for the fact that he was composing at all at such an early age rather than for the quality of his music. It wasn't until his Midsummer Night's Dream Overture at the age of 18 that he produced a lasting contribution to the repertoire. These concertos predate that, and by my calculations were written at the ages of 14 and 16. Those two years made a real difference and the Second Concerto is by far the more accomplished. That said, they are both attractive works, and the skill in their construction is undeniable. The First is stylistically very close to many of the String Symphonies, while the second moves more towards the virtuoso styles of some of the great pianist/composers of the day, early Chopin and perhaps Field. All the melodies have bounce, but few are memorable. Contrapuntal development plays out in textbook fashion, impressive but rarely engaging. And structurally both works hold together well, although the musical material doesn't really justify the huge length of either. Even in his mature output, Mendelssohn rarely indulges in complex or dense textures, and simplicity is certainly one of the virtues of this music. It begs the question, though, of why two pianos are required. It rarely sounds like two pianos, and while I suspect there is a good deal of discourse between the solo instruments, they are not separated in the stereo array in this recording, so it is difficult to tell. They could both by more prominent against the orchestra, although the sheer quantity of orchestral music here suggests that the composer considered it an equal partner. The pianists put in good performances, and never try to milk the music for more emotion or substance than is there. The performance style balances a fine line between the Classical and the Romantic. Beethoven was, after all, still alive when these works were written, and the very disciplined use of rubato, by orchestra and pianists alike, alludes to the Classical conventions that were surely still in force in 1820s Berlin. On the other hand, the velvety sting lines, the occasional cantabile indulgences by the pianists, and the sheer size of the orchestra look forward to Schumann and even Brahms. But this is music to just enjoy rather than to ponder at length, and whilst its pleasures are simple, they are also numerous. For me, the best of it is to be found in the finale of the Second Concerto. The rondo theme, based on a descending four note figure, is about the most memorable on the disc. The pianos really take the fore, and the orchestra only intercede to provide brief up-beat tutti episodes that aren't a million miles from Haydn. But for all that classicism, you can really hear Mendelssohn's mature voice forming. Both the soloists and the orchestra are more indulgent here in terms of rubato and dynamic extremes, but this more mature music can cope. It is as if the players had been biding there time up to know, waiting for the composer's famous sophistication to emerge. When it does, it is well worth the wait.